In my site I’ve introduced some good choices when it comes to buying cheap wholesale made-in-China watches, including Miniinthebox.com, Priceangels.com, Eforchina.com, Aliexpress.com, Banggood.com and more. Now I’m adding DHgate.com into my personal list of the best Chinese sites to source watches. 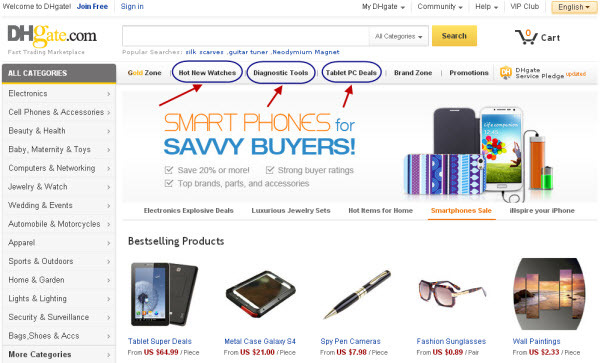 When you open the homepage of DHgate.com, you may notice that in the top navigation area above the banners, there are three exclusive accesses to the hottest categories or the best deals. Discounted watches or new style watches often appear in that area, which indicates that watches should be one of the best-selling products lines at the site. Based on my working experience at the e-commerce website, that area is very important and is one of the most commonly clicked sections of the whole home page. It is not a secret that the shopping sites like to take advantage of the most eye-catching sections to place the hottest promotions. For instance, the big banner zone is always the focus of the homepage of any online store. The top navigation bar is another attention catcher and tends to receive a significant proportion of visitors. To achieve the best promotional results, the stores would choose the best deals or the top rated products (offered by premium sellers if the store is a transaction platform like DHgate.com) to fill the pages for the exclusive zones. Generally, the products showcased on such pages are more dependable in terms of quality and the sellers who offer the products have a higher customer rating. Let’s just take a quick look at the Hot New Watches page. It includes five sub-categories in total: fashion watches, luxury watches, men’s watches, women’s watches and other watches. I personally love the vintage style pocket watches very much. Some LED watches and jewelry watches are very adorable too. There you can find the top 50 watches select from the heaps of made-in-China watches – all offered with at least 50% off and free shipping. The price for each and every watch there is very competitive. 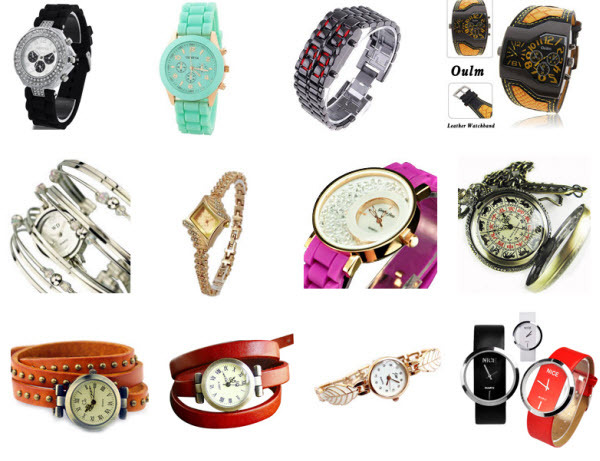 The fashionable watches are available at from $3 USD only. To say that the pricing is unbeatable is not an overstatement at all. DHgate.com usually stands out by ultra low wholesale prices and this selection of best rated watches is not an exception. If you are looking for top deals on watches made-in-China, the DHgate.com selection is worth checking out. While I encourage buyers to always do research as much as possible before placing the first order with a seller at DHgate.com, it is not so necessary to review the sellers for the promotional page of hot new watches too carefully. If you see a product of your desire there, just scan the basic store information and then buy it right away. The DHgate.com site has already reviewed the qualifications of these sellers so you can be confident that they are reliable. For the detailed review of DHgate.com, please click here. Is DHgate a Legit Company? I buyed a smartwatch from the seller Jsely. Nice watch at cheap price!